Provide comfort for the family of James Edward "Ed" Owens with a meaningful gesture of sympathy. James Edward "Ed" Owens, age 72, passed away in his home, on January 15th, 2019 in Mount Airy, Georgia after an extended illness. Mr. Owens, know by family and friends as "Ed", was born in Charleston, West Virginia on April 1, 1946, to the late Alta Slack Myers. In addition to his mother, he was also preceded in death by his step father, Mack Myers. He was a Navy veteran and long time resident of Virginia Beach, Virginia. 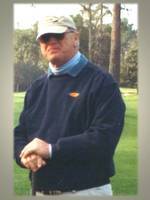 Ed was a successful real estate broker in the Tidewater Area for more than 40 years. He was an avid golfer and his favorite pastime was playing in the Blitz at Stumpy Lake Golf Course, where he was a member for over 30 years. Ed loved his family, golf, all things West Virginia, Tony's Hot Dogs, The Washington Redskins, the countless strays his wife Jenny saved and a good sense of humor, for which he was famous. He is survived by his wife, Jenny of the home; daughter Stephanie Denmyer of Virginia Beach, Virginia; son James "Bubba" Owens of Virginia Beach, Virginia; step daughters, Remy Garofalo of Athens, Georgia and Holly Shipman of Mount Airy, North Carolina; sisters, Barbara Hively of Clendenin, West Virginia, Sue Yeauger of Cairo, West Virginia; brother, Mack Myers Jr. of Youngsbottom West Virginia; six grandchildren. The family would like to express special thanks to Britt Dean of Pruitt Hospice. Habersham Crematory of Cornelia, Georgia (678/617-2210) is in charge of arrangements. To send flowers in memory of James Edward "Ed" Owens, please visit our Heartfelt Sympathies Store. We encourage you to share your most beloved memories of James Edward "Ed" here, so that the family and other loved ones can always see it. You can upload cherished photographs, or share your favorite stories, and can even comment on those shared by others. Provide comfort for the family of James Edward "Ed" Owens by sending flowers.